There's something about that moment right before the first star appears in the sky. You know - that quiet time, when the whole world seems to be holding its breath and waiting. It's an almost magical time, except that Kate doesn't believe in magic. She does have some big wishes, though. Dad is gone and Kate misses him. Her guitar is collecting dust because she won't sing without him. Then Grammy comes to live with them. She needs a bit of watching, because she's gone wandering. That's one big change in her life. Then her karate friend and neighbor, Parker, will be joining her class at school. He's been homeschooling till now. And one more big change: best friend Sofia is in a community theater production and seems to have found a new BFF! When Grammy tells her the three rules of everyday magic, Kate can't resist believing. At least a little bit. So she tries to follow Grammy's rules (believe, give, trust) to bring her dad back to her. Things don't go as expected, because if the did we wouldn't have a story, right? But will Grammy's magic and the karate wisdom from her Sensei help bring her dad back or heal the hole left by her best friend? What I like about this book: the writing is so honest. Kate isn't perfect. She lies. She gets angry. She's just a kid. 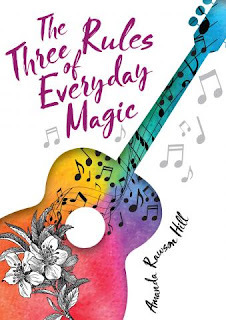 And while I don't really believe in magic, I really really want to believe that Grammy's simple rules of everyday magic can work for all of us. Because we could all use a bit more giving and trust in our lives, right? I also like the language. Take this bit: "It smells like cows. Like grass and rain and mud all pressed together in a heap." I may not live where Kate lives, but I can identify with that fresh mowed-grass-before-the-rain smell. Thanks for dropping by today. On Monday we'll be hanging out at Marvelous Middle Grade Monday with other bloggers. It's over at Greg Pattridge's blog, Always in the Middle , so hop over to see what other people are reading. Review copy provided by the publisher. The writing sounds wonderful. It's nice to have a kid who acts like a kid in a book. Thanks for a very thorough review. I will be looking for this one. Love that cover! Thank you for your wonderful review -- I love the themes and the tad of magic. Will put this on my list. Love the title and cover. This sounds like a good book. Thanks for the review. I hadn't heard of this book. You make it sound irresistible with the MC and what she is trying to accomplish. I've add this to my TBR list. Glad you enjoyed this so much. Having a realistic main character is important to a good book. Like Patricia, I like the magic too. Thanks for posting about this book for MMGM, Sue. I adore the cover art, and the premise for the story is intriguing. It's been added to my TBR list.